Everyone in Chicagoland seems to be talking about the big difference in weather patterns between this year and last. Dawn made the aptly stated point, at this time last year we were moving and getting settled into our new home. And how she would have gladly traded this weeks 30-40′ stretch of temperatures with last years 80′ run. Yep, we are through with winter and ready to get back outside. The kids are noticeably edgy too! Looking back on the move, it really was a whirlwind couple of days. We took a trip to Mexico to surprise my dad for his 60th birthday. Then, within a day of arriving home we were going to be moving (with 4 kids in tow). My dad and I nearly cooked ourselves installing some makeshift flooring in the attic to add some more much needed storage. It turned out to be the first of many projects we implemented over the past year. I think most of our first year living in our new home has been getting acquainted with it. Making peace with it’s little quirks and slowly making it fit with our family. It takes awhile to figure out just what a home needs. There is sooooo much we want to work on. But you know, there’s that whole money thing. Oh ya, and time to dedicate to projects is few and far between with the Grimm boys. If there is one thing I’m slowly coming to grips with, it’s this stuff does not happen overnight. There is no good substitute for patience and planning. And proper financing. As well, I’m finding it less stressful if we concentrate on one room at a time. That way we can call it done and move on. They say the fireplace is the focal point of any room. Which is probably why we choose to hit this up first. The previous/original owners must have been big fans of looking at themselves, because this place was lined in mirrors. Big ones at that. A floor to ceiling mirror which framed the fireplace and went all the way up the wall. A full wall decorative mirror in the toy room. Another full wall mirror in the kitchen. 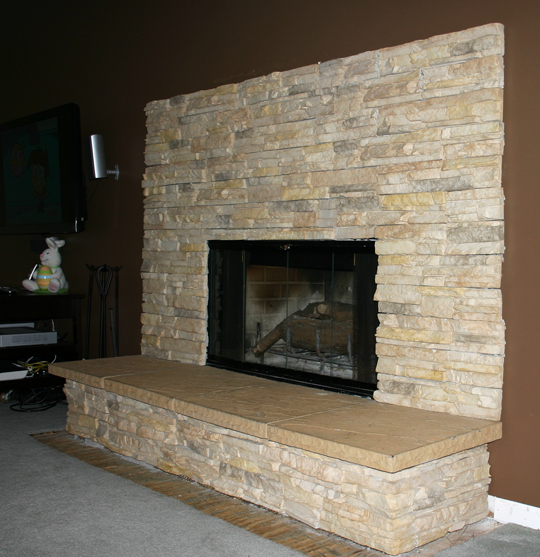 Here’s some shots from the fire place remodeling project. Still need to get the mantle going…. We desperately needed some storage for all the toys we have accumulated over the years. 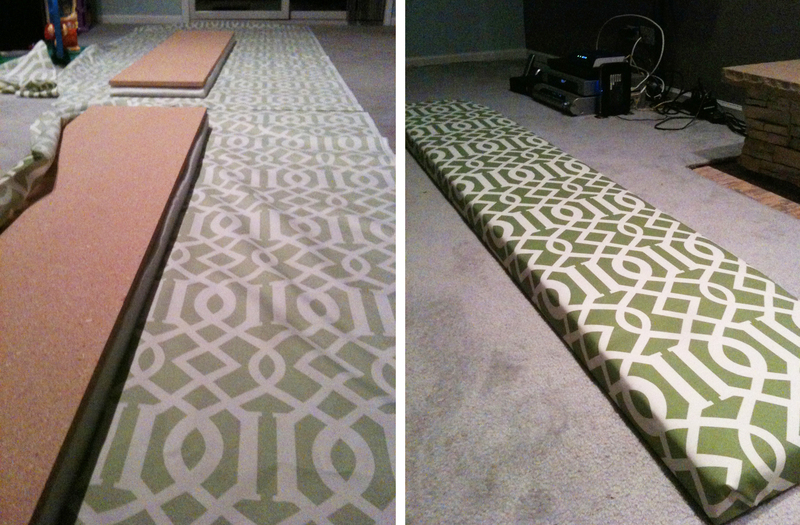 Dawn did some research and found a great and relatively simple bench idea using a couple of Expedit bookshelves. We worked together on this one and could not have been more pleased with the finished product. It serves so many purposes. It has helped solve our storage woes. It really helps decorate an otherwise toy populated room. And it also functions as a fairly comfortable piece of furniture. Here are a few of the projects we hope to accomplish over the next year or so. Lets see where we stand come this time next year. This is first on the list, and I might lose my marriage if it is not done before summer. The carpet we inherited has seen better days. The family room is where we tend to congregate, so we want to tackle it first. Replacing this old/dirty/musty carpet with something more our taste is step 1. Our growing family is no longer suited to the $50 Ikea table I bought once upon a time for Dawn and I. It’s time to add some more seats to our table. Having a dining nook is something I felt this kitchen could use from the moment I saw it. Our friends over at Forever Home did a brilliant job at building one of these from scratch. I was having a hard time finding any DIY how-to’s or building plans on nooks. But Mike has given me some good tips which I hope to start working on this spring. We have been putting off decorating this room and filling it proper until we get the floor done. It’s such a huge space so it’s going to take a lot to fill it with our wants. But we should be able to get some items of choice in there pretty soon. Being on a 1/2 acre lot is both a blessing and a curse. The mowing does not take half as long as I thought it would. The upkeep and pruning of the trees is something I completely overlooked. It’s a beast of a task which never feels done. Beyond that, our beloved previous owners, decided to pretty much dump a whole pool and deck and all it’s scrap in the far reaches of the yard. Along with every stick or unwanted material over the past decade. When I look at what it was when we first moved in to what it is now, we made quite a dent in the mess ($300 dumpster rental later). There is still A LOT to go. It’s one of those things that I wake up to every day, look upon, and want it done right now. I feel like we can’t move forward with any fun landscaping moves until we get it all cleared up. It’s the artist in me wanting to work with a blank canvas, I guess. The front may not have the eyesores that the back does, but it’s not without it’s blemishes. The driveway is lined with some odd bushes along both sides. They make it near impossible to get out of your car if you are parked next to someone else. I just don’t think the positioning of these was ever considered. As much as I hate to rip up some beautiful plants, I feel we have no choice but to do away with them. Hopefully I can find somewhere to donate them to. Know of any place like that? Beyond that, it could really use a bit of landscaping love. Something I’ll fully admit I just don’t have the eye for at the moment. But I’m studying up and trying to figure out the science of a good landscaping job. The front will not be complete without a basketball hoop too! Have you seen our shed? It’s straight out of a horror flick. Which yes, gives it great character. If issues were purely cosmetic, I would leave it just as is. However, it’s got some structural age spots too. There’s gaping holes in the exterior, the roof is sagging. It has not seen a coat of paint since (gulp) before I was born. I want to keep the main structure in-tact, as it’s really an awesome shed. But I pretty much have to redo all the exterior facade, the roof, and I’d like to getsome plywood walls up over the studs. Ideally, I would like to make it more into a cozy/work-shop sort of feel. The amount of bugs, bees, and mice that call this shed home is a frightening thought. Time to whip it into shape. There is plenty more we want to accomplish, but I think this is a good start to the list. What are you planning on working on this year?? That looks like quite the list to me! On our list this year is to finish replacing the carpet with hardwood flooring in our whole upstairs. We are deciding whether or not to replace the banister. Like you, we are taking it one room at a time! We have been there for 3 years now and still have so much work to do! I really want to redo our stairs too, Rob. But figured it was too big a lit already. Good luck with the hardwood!